The video games retailer's acquisition of Spanish platform SocialNAT could help refresh its tired brand. Despite predicting a Christmas to forget and issuing a not very festive profit warning in December, Game Digital said in January that trading was much more stable than it had feared. Now it’s hoping to push on with diversification and its budding focus on eSports may prove very savvy indeed. It has just announced the acquisition of SocialNAT, an online eSports platform in Spain for an undisclosed sum. SocialNat has over 150,000 registered users and also organises regular events. Spain is Game’s second-biggest market after the UK, but more significantly, this reflects the retailer’s attempt to muscle in on the rapidly growing eSports market. It’s a clear acknowledgement of the industry’s rise and growing wider awareness too. 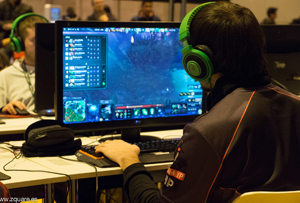 ESports is an increasingly viable way for video game fanatics to actually make a living. There are now agencies representing professional eSports players, while big name brands like Coca-Cola and Red Bull waded in for sponsorship a while back. Over 100 gamers have earned more than $250,000 in prize money alone, not taking into account the sponsorship deals pouring in and income many players receive from streaming themselves practising games on platforms like Twitch. The current top ten players have earned more than $10m in total, according to E-Sports Earnings and prize money at competitions is going up all the time. Game’s purchase of SocialNat marks its second step into the space after the £20m deal for live events group Multiplay last March. Total sales for the video games market were down 13.5% year-on-year and it’s a sensible move for the retailer to think about repositioning itself. Assessing where else it could be involved in the gaming 'experience' beyond the point of sale could be the way to go. ‘ESports present one of the most exciting developments in the industry and the acquisition of SocialNAT will help to accelerate our plans in this area,’ Pablo Crespo, MD of Game Spain, said. The eSports market is currently worth around $194m (£136m) a year and is predicted to grow to $463m in 2016, according to research firm Newzoo. The number of eSports ‘enthusiasts’ is expected to jump from 89m in 2015 to 145m in 2017, while 190m more will watch them occasionally. Newzoo's report said this shows ‘that competitive gaming has evolved to a spectator sport with a fan base comparable to that of volleyball, American football or ice hockey’. While North America and Asia are currently leading the way when it comes to audience figures, there’s growing interest in Europe that Game will want to tap into. As well as South Korea, North America and China, Europe hosts many of the industry’s notable competitions. It's not exactly first on the scene, but there’s clearly an opportunity for the retailer to heavily involve itself in this side of gaming, which could yet rejuvenate its own flagging brand. It doesn’t though, provide answers as to where that leaves the retailer’s bricks and mortar presence on the high street.